Select a Genera Cyana Walker - Cyana perornata Walker - Cyana saulia Swinhoe - Cyana conclusa Walker - Cyana maiae sp. n - Cyana cruentata Talbot - Cyana malayensis Hampson - Cyana selangorica Hampson - Cyana barisana Roesler & Kuppers - Cyana inconclusa Walker - Cyana costifimbria Walker - Cyana pudens Walker - Cyana horsfieldi Roepke - Cyana determinata Walker - Cyana infantula Hampson - Cyana sp. 4802 - Cyana effracta Walker - Cyana tettigonioides Heylaerts Thumatha Walker - Thumatha orientalis sp. n. Asura Walker - Asura fulguritis Hampson Lyclene Moore - Lyclene biseriata Hampson comb.n - Lyclene apiseriata sp. n. - Lyclene sp. 5206 - Lyclene xanthopera Hampson comb. n. - Lyclene postseriata sp. n. - Lyclene acutiseriata sp. n. - Lyclene falciseriata sp. n. - Lyclene circumdata Walker stat. rev. - Lyclene quadrata sp. n. - Lyclene poring sp. n. - Lyclene obscurilinea sp. n. - Lyclene mesilaulinea sp. n. - Lyclene obtusilinea sp. n. - Lyclene angulinea sp. n. - Lyclene pudibunda Snellen comb. n. - Lyclene pseudobunda sp. n. - Lyclene cuneigera Walker comb. rev. - Lyclene classeigera sp. n. - Lyclene ashleigera sp. n. - Lyclene cuneifera Walker comb. rev. - Lyclene areolifera sp. n. - Lyclene angulifera sp. n. - Lyclene unguifera sp. n. - Lyclene multiramorum sp. n. - Lyclene fusciramorum sp. n. - Lyclene peloa Swinhoe comb. rev. - Lyclene obsoleta Moore comb. rev. - Lyclene calamaria Moore comb. n. - Lyclene distributa Walker comb. rev. - Lyclene synestramena Hampson comb. n. - Lyclene asaphes Hampson comb. n. Cabarda Walker Gen. Rev. - Cabarda sequens Walker comb. rev. Adites Moore Gen. Rev. - Adites bizonoides Walker comb. n - Adites sandakan sp. n. - Adites temburong sp. n. - Adites curvata sp. n. - Adites alticurvata sp. n. - Adites hosei sp. n. - Adites pseudolyclene sp. n. - Adites bifida sp. n. - Adites parang sp. n. - Adites trusmadi sp. n. - Adites longispina sp. n. - Adites cornutata sp. n. - Adites vagilinea Walker comb. n. - Adites frigida Walker comb. n. - Adites pseudofrigida sp. n. Quadrasura Gen. Rev. - Quadrasura ktimuna van Eecke comb. n. Barsine Walker Gen. Rev. - Barsine lucibilis Swinhoe comb. rev - Barsine euprepia Hampson comb. n. - Barsine rosistriata Holloway comb. n. - Barsine rubricostata Herrich-Schaffer comb. n. - Barsine roseororatus Butler comb. n. - Barsine cruciata Walker comb. n. - Barsine euprepioides Walker comb. n. - Barsine bornescripta sp. n. - Barsine curstata Talbot comb. n. - Barsine lineatus Walker comb. n. - Barsine flavodiscalis Talbot comb. n. - Barsine complicata Butler comb. n. - Barsine pallinflexa sp. n. - Barsine exclusa Butler comb. rev. - Barsine porphyrea Snellen stat. rev. & comb. n. - Barsine sullia Swinhoe stat. rev. & comb. n. - Barsine perpusilla Walker comb. n. - Barsine syntypica Swinhoe - Barsine hypoprepioides Walker comb. n. Graptasura Hampson - Graptasura trilacunata sp. 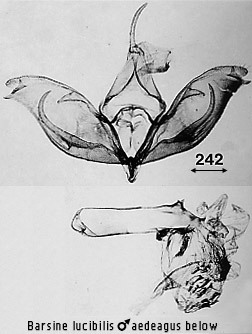 n. - Graptasura mesilau sp. n. Eutane Walker - Eutane nivea Hampson - Eutane alba Hampson Schistophleps Hampson - Schistophleps fulvioides sp. n. - Schistophleps punctifulvia sp. n. - Schistophleps microfulvia sp. n. - Schistophleps alluvifulvia sp. n. - Schistophleps lobifulvia sp. n. - Schistophleps pyrifulvia sp. n. - Schistophleps nigropuncta sp. n. Nudariphleps Gen. N - Nudariphleps gauldi sp. n. Chamaita Walker - Chamatia trichopteroides Walker - Chamatia sundanympha sp. n. - Chamatia sp. 5263 Caulocera Hampson - Caulocera crassicornis Walker - Caulocera xantholopha Hampson Nudaria Haworth - Nudaria phallustortens sp. n. - Nudaria sundamollis sp. n. - Nudaria albipunctella Hampson comb. n.
Barsine lucibilis Swinhoe comb. rev. Miltochrista lucibilis Swinhoe; Holloway, 1976: 3. Diagnosis. This and the next two species have forewings with a longitudinally striate pattern with transverse grey fasciae, grey along the veins distal to the postmedial, and red in the spaces everywhere. In lucibilis the postmedial is entire, more regularly curved, the curvature strongest towards the costa. Spining in the aedeagus vesica appears to be variable. Taxonomic note. The relationships of this species were discussed by Holloway (1982: 213). Habitat preference. This is a frequent species of lowland forest, occurring also in disturbed habitats and up to 1000m. In Brunei it was found to be particularly frequent in dry heath forest in the Telisai area.